I’ve been hearing about a large rabbit. C’est très alarming. Could it be you are referring to the Easter Bunny? Oui, that’s the one. Molly says he plans to steal the eggs from our chickens. The Easter Bunny isn’t interested in our chickens. He is a benign pagan creature who once was a symbol of fertility, springtime and new life, but sadly now just deals in decorated eggs and iconic candy – hollow milk-chocolate bunnies and Peeps. Peeps? Peeps, c’est quoi? Those petit sticky yellow confections? Pah. C’est un terrible imitation of baby chicks, which I’m sure in real life are vraiment tasty snacks. I have contempt for this Easter Bunny. I will allow Molly to chase him away with her yapping. You are very generous to let Molly handle the situation. Is she worried about the Easter Bunny? Molly assures me that this abnormally large lapin, this so-called Easter Bunny, is a very disturbing character. She informs me that you, Madame, are being strangely casual about le security, that you are not alarmed about this dangerous intruder. She plans to bark loudly at him until he drops the goodies and flees. 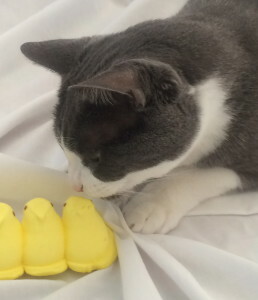 Then she plans to eat the Peeps. We can all be grateful Molly has the situation diligently in hand. I have nightmares about Peeps. So glad Puffin and Molly are on the lookout!